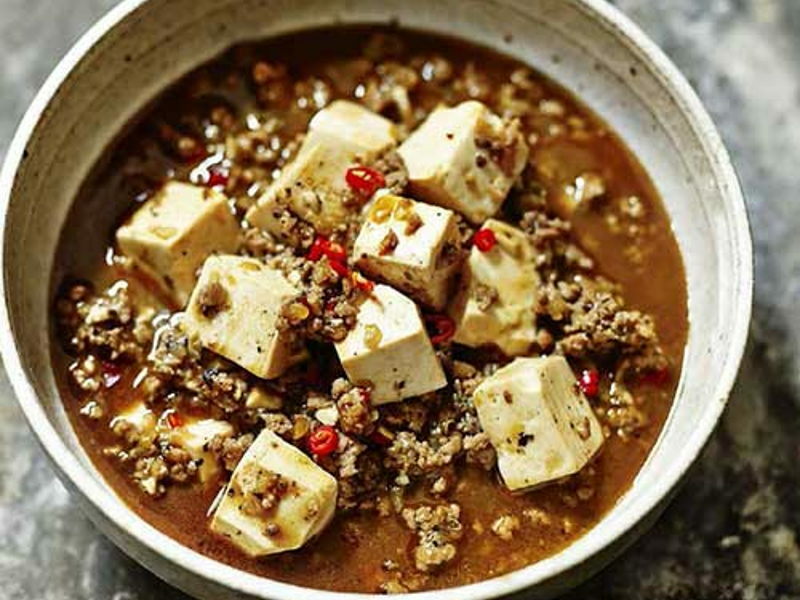 Place the pork mince in a bowl and massage all ‘the marinade’ well into the meat and place in the fridge to continue to marinate. Finely grind the peppercorns under a heavy pan or wok and place into a separate bowl. Finely slice the spring onion and place in a separate small prep bowl and carefully slice the tofu into 1cm cubes. Mix together all The Sauce ingredients, finely chop the chillies, and add to the sauce mixture. Now build your wok clock; first the onions at 12 o’clock, then the 2 tsp. Chilli Bean Sauce, pork mince, crushed peppercorns, ‘sauce’ bowl, cubed tofu, and lastly the spring onion. Heat 2 Tbsp. vegetable oil in a wok on a high heat until smoking hot. Add onions and stir-fry until lightly charred. Then add the Chilli Bean Sauce, reduce the heat to medium-high and continue to stir fry for a further 30 seconds before adding in your marinated minced pork. Stir-fry for 2-3 minutes until all of the mince has been broken up and is well browned. Increase the burner to a high heat before adding in the crushed Sichuan peppercorns, followed by ‘The Sauce’. Continue to stir-fry on a high heat, bringing the sauce to a vigorous boil before adding the diced tofu to the wok. Stir gently without breaking the tofu, just enough to wrap the sauce around the tofu. Cook for a further 3 minute before removing from the heat, and adding the spring onion and a drop of sesame oil to finish.